A while back I stumbled across a recipe online that would turn into one of my party favorites and entertaining staple for years to come. Gena Hamshaw over at The Full Helping blog created a recipe that can stand the test of time. Every single time I make her Polenta Squares with Walnut Tapenade I would end up licking every spoonful from the bowl, not to mention finishing 5-10 completed polenta/tapenade bites before the party would start. 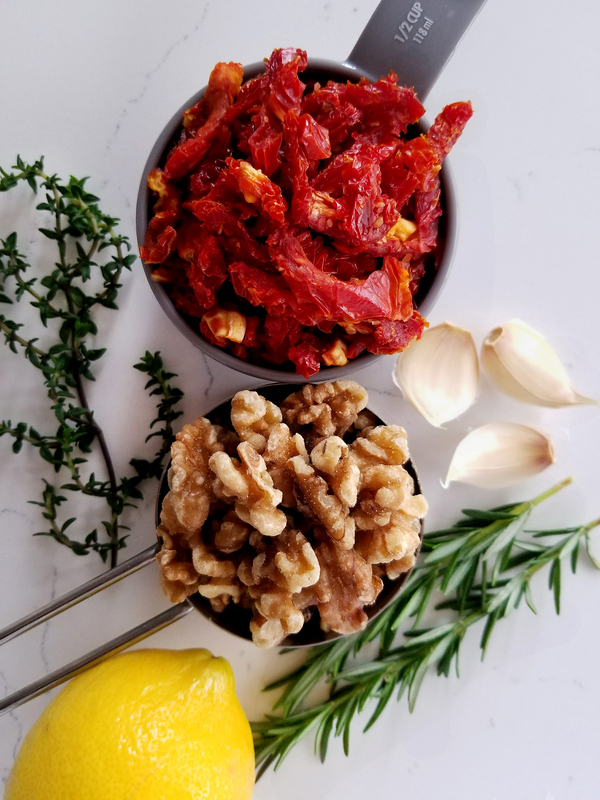 That recipe will be in my arsenal forever because there is something about that combination of bright tomatoes, earthy nuts, garlic, and herbs that makes you want to close your eyes and go to your happy place. A few weeks ago, while I was making some hummus, the thought of those salty creamy bites of polenta and it sparked an idea. Can I turn those delicious bites into a vehicle for veggies? And this dip was born. 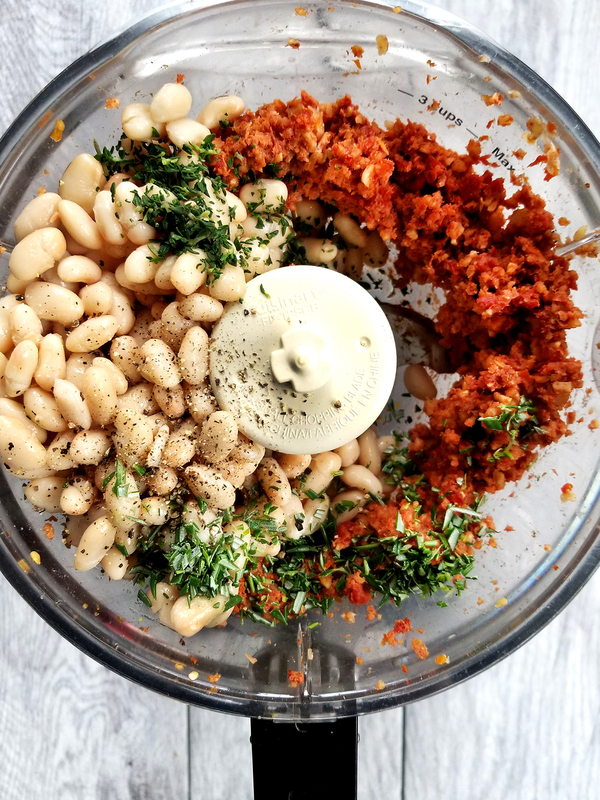 Using super creamy Italian cannellini beans as a mild but silky-smooth base pairs well with the salty and herbaceous mix of sun-dried tomatoes, rosemary, and thyme. This dip is sure to be the new star of your vegetable platters. Move over hummus, there is a new sheriff in town. 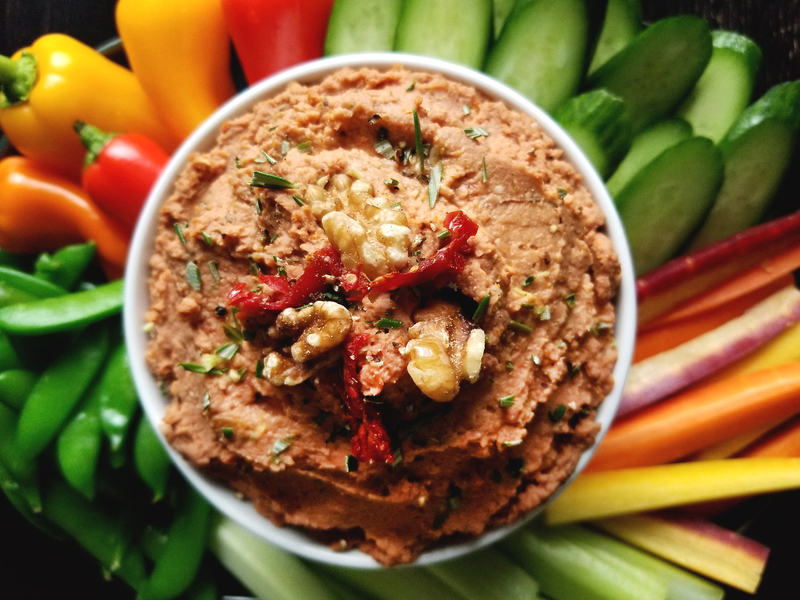 Simple, and flavorful white bean dip with sun dried tomatoes, walnuts, fresh herbs and garlic. 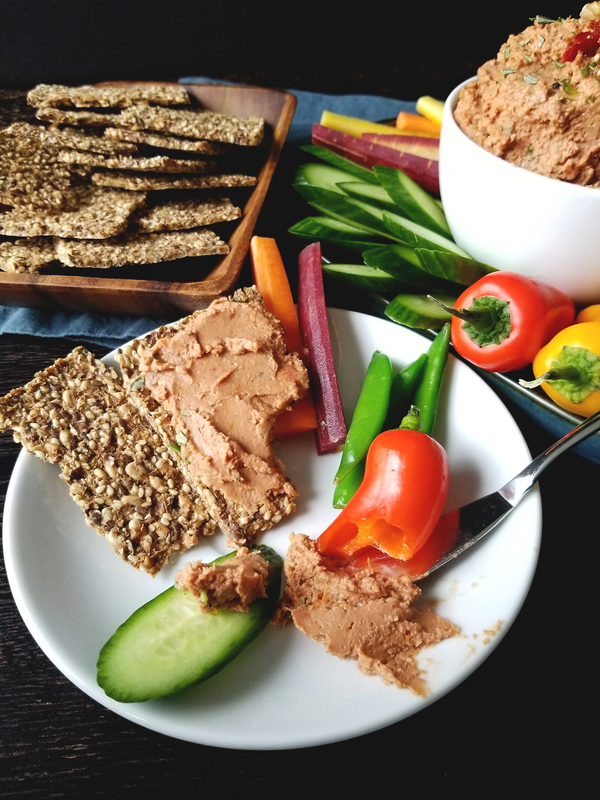 Gluten-free, and perfect for fresh veggies, crackers or a killer sandwich! 1. 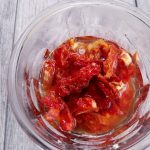 In a small bowl, place the sun-dried tomatoes and the boiling water, set aside until tomatoes are soft, about 20 minutes. 2. 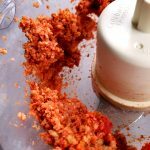 In a food processor blend the tomatoes, walnuts, and garlic with a few tablespoons of the sun-dried tomato water. Scrape the sides down and continue pulsing until a paste forms. 3. Add in the beans, lemon juice, rosemary, and thyme. Blend, if it is too thick keep adding the tomato water 1 Tbsp at a time. Finish with salt and pepper to taste. 4. 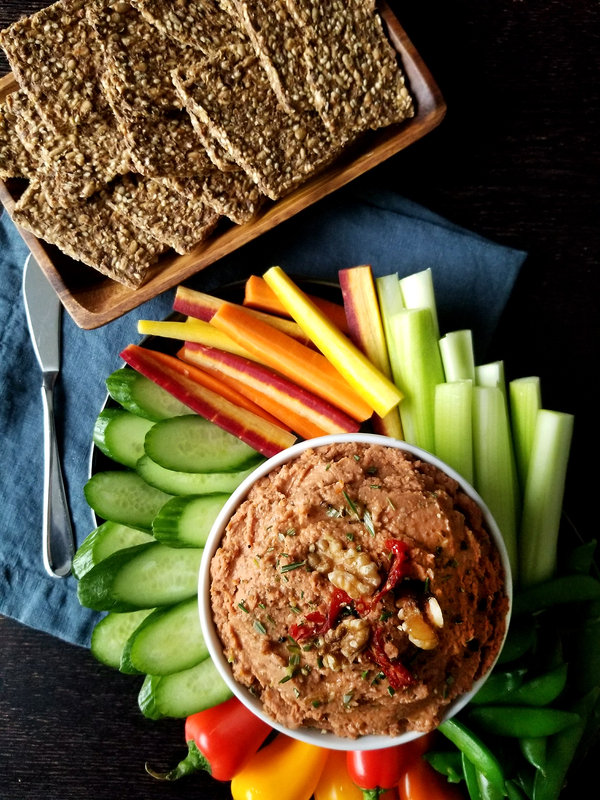 Enjoy with your favorite veggies or crackers! To make cannellini beans from scratch, which will create a much creamier finished product, rinse and sort the beans, place dried beans in a bowl, fill the bowl with water about 2 inches above the beans with 1 tsp of baking soda, leave overnight. Rinse beans and place in a pot with fresh water. Bring to a boil then simmer until cooked, about 30-45 minutes. 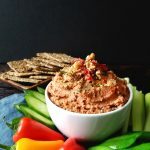 You can use any white bean, such as Great Northern Whites, but it will result in a starchier dip, so if you do that maybe add more nuts to make it creamier.